The Kings snuck into the playoffs last season before getting ousted by the upstart Vegas Golden Knights. Los Angeles will need to find a way to hang in an ever-improving Pacific Division. Critics of the Kings over the past few seasons say they’re too old, they lack speed and they don’t score enough goals. Enter big summer acquisition Ilya Kovalchuk. The 35-year-old can’t do much about his birth certificate, and his wheels are average at best. But, boy, can he score. Kovalchuk was 29 the last time he played in the NHL, and he did earn Hart Trophy votes in his final two seasons with New Jersey before leaving for five seasons in the KHL. He lit up the scoresheet for St. Petersburg, scoring 138 goals in 298 games, and his past two seasons there were his best. The NHL game has changed a lot since Kovalchuk left, but scoring is still critical, and the sniping left winger is sure to get a lot of playing time next to Anze Kopitar. Even if Kovalchuk is a shadow of his former self at 5-on-5, he’s bound to help the NHL’s 17th-ranked power-play unit. The Kings have one of the oldest rosters in the league, but they also have vital cogs at all positions. Jonathan Quick bounced back well with a healthy season, and Jeff Carter is expected to do the same as one of the NHL’s top second-line centers. Locking up Drew Doughty for eight years only means good things for the blueline. The Kings flirted with 100 points last season yet had to settle for a wild-card playoff spot and were swept in the first round by division champion Vegas. Is there a chance Los Angeles plays just as well in 2018-19 but nevertheless falls out of the playoff picture? It’s not getting any easier in the Pacific. Calgary is on the upswing after loading up with trades and free-agent signings in the off-season. And maybe Edmonton more resembles the 103-point team it was in 2016-17 than last season’s 78-point version. It doesn’t look as though Vegas, Anaheim and San Jose are going to fall off much. So maybe by virtue of just getting older and presumably a little slower, the Kings fade ever so slightly this year. There has to be some concern from management and fans that second-liners Tyler Toffoli and Tanner Pearson haven’t come close to matching their career-best goal seasons from three and two years ago, respectively. Los Angeles has long taken pride in its defense-first approach during this glory decade, and it’s hard to argue with two Cups. But the ease with which Vegas’ speedy, energetic attack manhandled the Kings in the playoffs has to have some fans feeling nervous. How does Ilya Kovalchuk fare in his return to the NHL? Though there’s questions to be asked of Alex Iafallo and Adrian Kempe, as well as the rest of Los Angeles’ youth, Kovalchuk is front of mind for everyone watching Los Angeles this season. As noted, he’s far removed from his last NHL campaign — he last saw big-league action in North America during the lockout-shortened 2012-13 season — but Kovalchuk was a big producer then and the hopes are he will be a big producer now. In his final three NHL campaigns before departing for the KHL, Kovalchuk scored at a .41 goals per game rate and .90 points per contest. Those are remarkable numbers. True, he’s older, slightly slower and going to be adjusting back to the NHL game this season, but the one thing he won’t have lost is his shot. He can absolutely rifle a puck, and on a team that is lacking a pure shooter of his ilk, that can mean big things for the Kings. The one area we should watch Kovalchuk especially closely is the power play. Los Angeles’ power play has been middling over the past few seasons, and Kovalchuk gives them the kind of triggerman that could turn that around in a hurry. 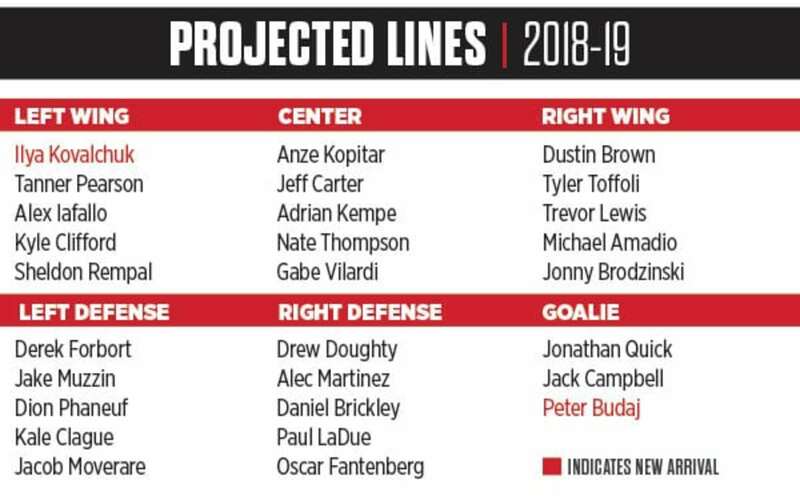 THE HOCKEY NEWS’ PREDICTION: 5th in the Pacific Division. The Kings are no longer the class of the division, but they’re not a basement team, either. Los Angeles’ hopes are tied not just to Kovalchuk’s success, but the health of Jonathan Quick, who has battled a few ailments over the past several years. He was exceptional last season, but the crease lacks depth and an injury to Quick could derail the Kings’ season in an instant.